Hist. Pl. (Baillon) 12: 68 (1892). 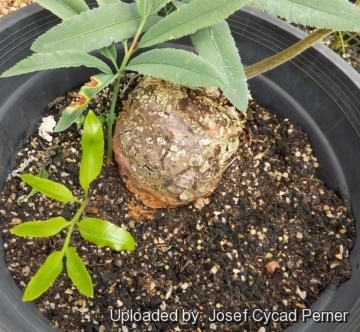 A 24 years old specimen raised from seed. Origin and Habitat: This species is widespread along the east coast of South Africa (33° 30' S) and southern Mozambique (27° S). Plants usually never occur further than 50 km from the ocean. They are found as scattered subpopulations from Bathurst in the Eastern Cape to Kosi Bay in northern KwaZulu-Natal and just over the South Africa border into southern Mozambique. There are numerous subpopulations spread across its range. It is estimated that there are more than 100,000 plants in the wild. Altitude range: 10 to 750 metres above sea level. Habitat and Ecology: Stangeria eriopus grows in open, dry grassland, in light shade under trees in the coastal parkland, or in dense, damp lowland forest. Found in sandy soils (derived from sandstone) or sometimes in granitic or heavy black clays, all of which are slightly acidic, usually within a few kilometers of the ocean. They are found in scarp and coastal forests, Ngongoni and Coastal Grassland. They occur near the sea, but in sheltered habitats as they do not tolerate the salt spray. Annual rainfall varies from 1 000 mm in the north to ± 750 mm in the southern part of the distribution area. About two thirds of the rainfall occurs in the summer months. The average minimum temperature in the southern part of the distribution range is 14° C, increasing to 17° C in the Durban area and probably higher on the Mozambique border. Frost occurs very seldom in this area.This species is threatened by over collecting (for medicinal and ornamental use), habitat destruction has also had an effect on the plants in the wild (pineapple and sugar cane farming). Lomaria coriacea Kunze non Schrad. Stangeria paradoxa f. Katzeri (Regel) J.Schust. Stangeria paradoxa f. schizodon (W.Bull) J.Schust. 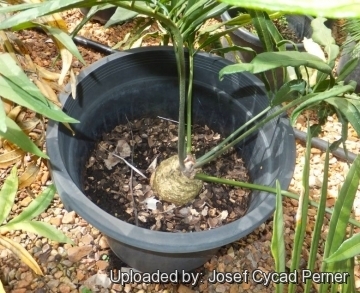 Description: Stangeria eriopus is a perennial, slow-growing cycad endemic to southern Africa which lives to a great age. It is the sole species in the genus Stangeria, most closely related to the Australian genus Bowenia, with which it forms the family Stangeriaceae. Stangeria eriopus has pinnately-veined, fern-like leaves that distinguish it from all other cycads. The body of the plant (rootstock) consists of a large tuberous root which is swollen and carrot-shaped, it usually branches freely with each stem bearing a cone at the same time. The species occurs as two variable forms or varieties in different ecological habitats. The tall graceful leaves produced by plants within forests are very different from the relatively small hard ones characteristic of plants in open grassveld. Those growing in open grassland have short leaves with leaflets that are hard in texture and are rounded at the tips of the leaflets. Those growing under forest conditions have taller leaves (1 to 2 m) with numerous soft fringed leaflets. As there is no difference in the cones, separation into 2 different species does not appear to be justified. Derivation of specific name: The prefix 'erio' maeans 'woolly' and refers to the velvety hair which covers the stem of the leaf when it first appears. Stem (rootstock or caudex): Subterranean, tuberous, turnip-shaped, up to 10 cm in diameter, continuous with a variously carrot-shaped root (or roots), branched or unbranched. Branches short and thick, cylindrical to obovoid. The tuberous rootstock is regarded as all underground stem by some writers but the basal portion is a tuberous root which develops rapidly in the seedling stage. The transitional area between stem and root is not readily detected. The woolly scales ovate, early deciduous persistent only at the apex. Occasionally the stem may branch into 10 or 12 heads. Leaves: 1–4 to each crown of the stems and these are extremely variable in size and shape depending on the habitat. In open grassland they may only be 25 to 30 cm in length while those growing under forest conditions may be 1 to 2 m tall. When young, the leaf is rolled up at the tip (circinate) and fern-like. Petiole as long as or longer than the blade, deeply grooved on the upper side, glabrous. The size and the number of the leaflets also vary considerably. They may vary from 5 to 20 pairs and may be opposite or subopposite, the lowermost stalked, the upper united and decurrent on the rhachis on the lower side. Median leaflets may be 10 to 40 cm in length and 2 to 6 cm broad, with numerous very closely parallel forked pinnate lateral nerves, glabrous, elongate-lanceolate, acutely acuminate to rounded at the apex. The margins of the leaves may be entire, serrated or deeply fringed according to the locality. Cones: Each stem produces a solitary cone. 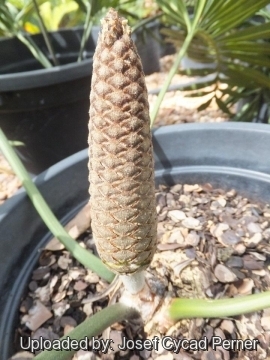 Both male and female cones are silvery pubescent at first becoming brownish with age and pedunculate. Male and female cones are borne on separate plants. 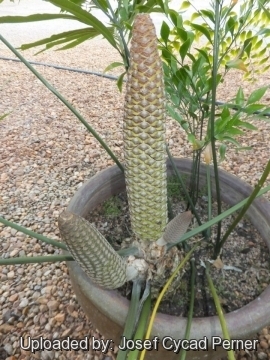 Male cones: Solitary, brownish, pedunculate, cylindric, sub-cylindric, slender, gradually tapered to the apex, 10-15 cm long long, up to 3-5 cm in diameter, with numerous spirals of closely imbricate upwards, scales. Scales at first woolly, soon glabrescent, broadly triangular or rhomboid, jagged-toothed, bulla face curved upwards with sharp teeth on margin. Female cones: Solitary, shortly pedunculate, densely tomentose, ovoid-ellipsoid, 18 to 20 cm in length and 8 to 10 cm in diameter. Scales stalked, deltoid, closely overlapping, with the lower side rounded. Bulla with slightly convex peltate face, imbricate upward, irregularly toothed on margin. Seeds: Broadly ellipsoid to almost round, dark red, about 2.5-3.5 cm long, 2.5 cm in diameter, angled by compression, with very fleshy aril (covering) adhering firmly to the thin hard inner coat encasing the copious endosperm. Taxonomic note: At first glance the leaves of Stangeria eriopus resemble those of ferns and in fact it was first classified as Lomaria eriopus by German botanist Otto Kunze in 1829. Only when a plant produced a cone at Chelsea Physic garden in London, was it realised that it belonged to the broad cycad family. It was promptly described as a new cycad genus by English botanist T. Moore, who also gave it a new specific epithet of paradoxa, a reference to the confusion with ferns. This was inadmissible under the rules of botanical nomenclature, and the correct combination of Stangeria eriopus was made by French botanist Henri Baillon in 1892. 1) Williams, V.L., Raimondo, D., Crouch, N.R., Cunningham, A.B., Scott-Shaw, C.R., Lötter, M. & Ngwenya, M. 2010. “Stangeria eriopus.”. The IUCN Red List of Threatened Species 2010: e.T41939A10605838. http://dx.doi.org/10.2305/IUCN.UK.2010-3.RLTS.T41939A10605838.en . Downloaded on 20 September 2015. 3) Haynes J.L, “World List of Cycads: A Historical Review”, IUCN/SSC Cycad Specialist Group, 2011. 5) J. Hutchinson & G. Rattray “Flora Capensis”, Vol 5, Part 2 (Supplement), page 24, 1933. 6) Dr J.P. Roux “Flora of South Africa”, 2003. 7) Crouch, N.R., Donaldson, J., Smith, G.F., Symmonds, R., Dalzell, C.G.M. & Scott-Shaw, C.R. “Ex situ conservation of Stangeria eriopus (Stangeriaceae ) at the Durban Botanic Gardens, South Africa.” Encephalartos 63: 16-24. The Cycad Society of South Africa.2000. 8) Douwes, E., Gillmer, M., Mattson, M. & Dalzell, C. “Vegetative propagation of Stangeria eriopus from leaf material.” Encephalartos 80:28-30. The Cycad Society of South Africa. 2004. 9) Vorster, P. & Vorster, E. “Stangeria eriopus.” Encephalartos 2: 8-17. The Cycad Society of South Africa.1985. 10) John Winter Kirstenbosch Botanic Garden November 2006 “Stangeria eriopus” in: Plantzafrica <http://www.plantzafrica.com> Web. 3 feb. 2015. 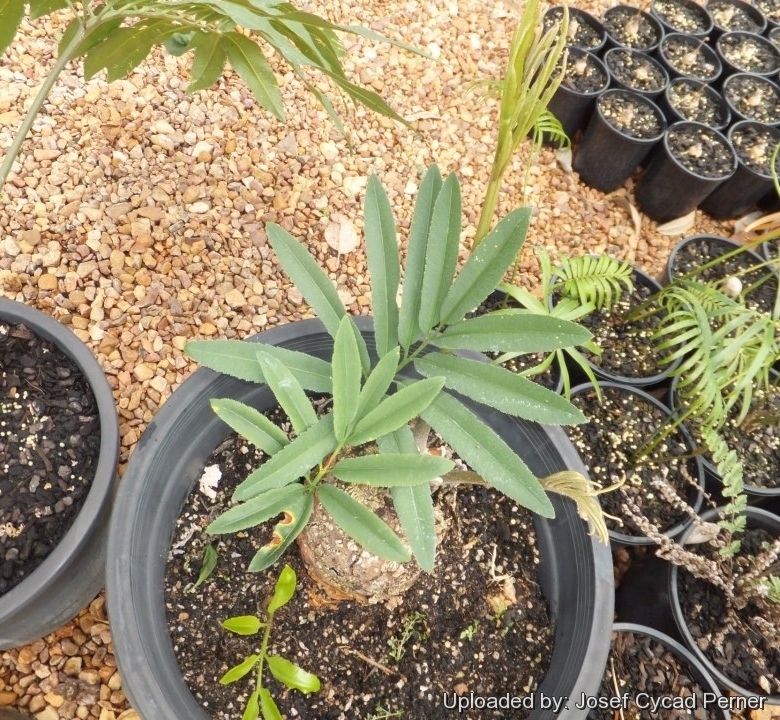 11) Robert Buckley “A New Significance for Stangeria.” In: The Cycad Newsletter. 24(4) 1–5, 2001. 14) Wikipedia contributors. "Stangeria." Wikipedia, The Free Encyclopedia. Wikipedia, The Free Encyclopedia, 25 Sep. 2014. Web. 21 Sep. 2015. Cultivation and Propagation: Stangeria eriopus is a most attractive plant with its large fern-like leaves and is an ideal plant for shady gardens. It is an adaptable plant well suited to warm temperate and tropical climates. It is more moisture-tolerant than most South African cycads. It can also be grown in full sun without its leaves burning. It is long lived and very slow-growing and require little maintenance once established. As a garden plant, this cycad will usually grows well under cultivation and responds to generous treatment. Ample moisture and light shade will produce luxuriant growth. Plants in the garden are frequently deciduous while those grown under greenhouse conditions may retain their leaves through 2 or 3 cycles. Plants are frost-tender. Stangeria is also an ideal pot plant provided they are planted in a large container which provides plenty of room for root development. Restricting root development retards the growth of the plant and it tends to struggle. Soils: It prefer well drained, gritty soil with plenty of water, especially in dry weather. Waterings: In cultivation prefers moist soil with good drainage for optimal growth. But it is eventually drought resistant. High pressure irrigation systems which produce a strong jet of water will destroy those beautiful leaves; Stangeria will be better suited to rather use an irrigation system which provides a gentle application of water. Fertilization: To maintain a healthy plant, regular feeding is essential. Growth can be greatly improved through the application of fertilizers. Most growers find that a fertilizer having an even NPK (Nitrogen, Phosphorus, Potassium) balance, and supplemental trace elements, provides a good start for cycads. In early spring also apply a mixture of bonemeal, and organic fertilizer. A 50 mm layer of well-matured compost applied as a mulch in the autumn helps to improve the soil and benefits the plants. Exposure: It thrives best in shady areas but grows in full sun or partial shade too. Pest and diseases: Mealybugs. They need to be sprayed with a systemic insecticide. Traditional uses: The tubers are harvested for medicinal purposes by traditional healers. Propagation: It may be propagated by seeds, division of branched tubers or by rooting leaf stem cuttings. They are among the easiest plants to germinate. Stangeria eriopus doesn't produce hybrids with the other cycads. Provided both male and female plants are planted in a group it is left to pollinate naturally by wind and insects which produces good quantities of viable seed. As the female cone begins to disintegrate, the seed should be harvested. Place the seed in water for a day and then remove all of the soft tissue. The clean seeds are then stored in a cool, dry place until the following spring when it is sown on a bed of clean coarse sand which has a bottom heat of 25-28°C. The seeds are pushed into the sand so as that they are level with the surface of the sand. Water each day and within two months the seeds begin to germinate by producing a root followed by leaves. Within10 months the seedlings are removed and potted into a 3 litre plastic sleeve containing a well-drained growing medium which contains some agricultural lime. The seedlings are watered sparingly until they show signs of growth. Within a year these seedlings need to be repotted into 30 cm pots to encourage the plants to develop. Keeping Stangeria in small containers prevents them from growing. Once in the open ground they develop well. To produce plants from cuttings, an entire leaf needs to be broken off the stem of the plant. This ensures that a portion of stem is attached to the base of the cutting which is essential for rooting. The leaf itself is trimmed back to prevent loss of moisture. The base of the cutting is treated with a rooting hormone and placed in a rooting medium of clean, coarse sand at a depth of 8 cm. Within 10-14 weeks, callus and root development occurs and after 18 months a well-developed root system is established.